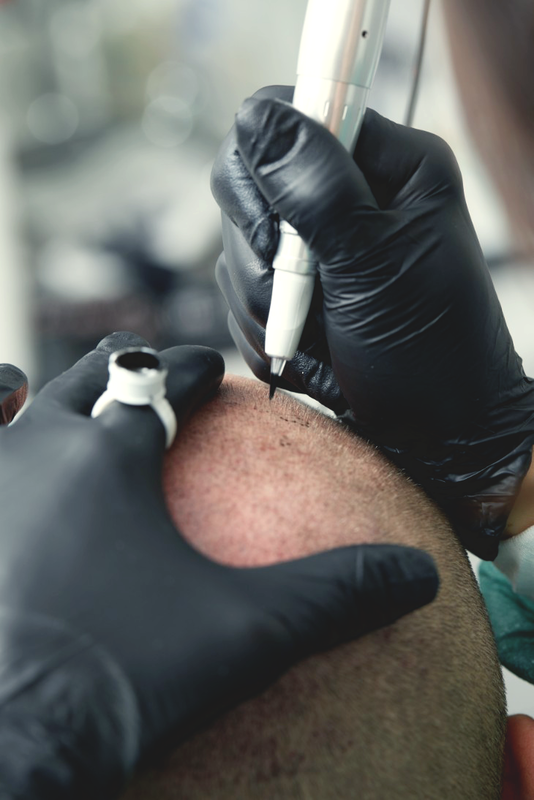 Understanding the process of Scalp Micro Pigmentation (SMP) often leads to the immediate decision to undergo the life-changing treatment. Compared to other hair solutions, Scalp Micro Pigmentation offers non-surgical, low cost, and guaranteed results. Natural, Custom-Made pigments are injected into the epidermal layer of the scalp in order to mimic the true appearance of real hair follicles. Darkness and density during the application process may be customized to create your desired look. Upon consultation, our Certified practitioners will assess your scalp and the direction of your natural hair growth. Together, you will discuss your desired look and type of hairline. Based on your desires, your practitioner will speak to you about what options that you have for hair follicle replication. Your practitioner will also help you determine the best hairline for your face and even draw a rendering of your scalp to show you the possibilities. SMP is a process that may be used for all skin types, colors, and stages of hair loss. It is common for multiple shades of pigment to be used on a client to create the most realistic representation of their original hair. Scalp Pigmentation is a hair follicle replication process that helps people suffering from different types of hair loss, thinning hair, etc. We use our specially designed pigments and unique application to replicate hair follicles in your scalp. This treatment is non-invasive and requires no surgery. We utilize a special micro-needle, smaller than commercially available needles, resulting in more realistic results. 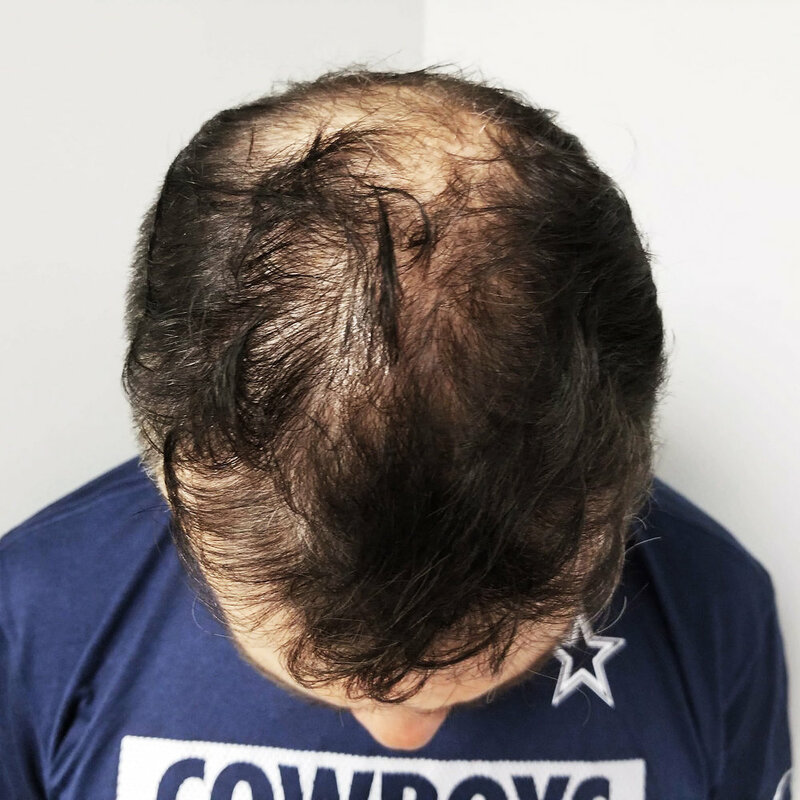 Specialized needles developed specifically for Scalp Micro Pigmentation are utilized to create very fine injections into the scalp to replicate the look of natural hair. 3 needles work in sync gently over the scalp to create the most natural pattern possible. Will you be able to tell if I had the procedure done? The look we provide is unbelievably authentic and realistic. Unless you've told them, they would have no clue. Not one client we have treated has been noticed. It will make you look younger and feel more confident. 5 years without touch-ups, or as long as you want it to with touch ups when needed. What if my hair turns grey? In this case, no touch-ups will be done and you will let the pigment naturally fade so it lightens up, and then we'll adjust to a lighter shade when touch ups are started again. Most all follicles (stubble) are a certain shade of black whether light or dark when shaved down so they can be easily matched, even red and blonde hair. You don't see the color until the strand begins to grow out of the shaft. How will I look after my first Treatment? There will be redness for 24-48 hours after treatment, it depends usually on your skin type and after care product is given to help speed up the process. Most of our clients have a horseshoe pattern and need a hairline, top, sides and blending. These jobs usually range between $800-$4,200 and are based on the specific needs of the client. There are also “fills” this procedure is the same process but for clients who do have hair and want to make the there hair more dense and a fuller appearance. For more information, please contact us to book a consultation. 3-5 hours the first session, and usually only 2-3 hours for the second session. The third session is around 1 hour, depending on your needs and skin type. Will kind of pigment is used / does the color change? Our pigments are 100% organic with no color additives, this is specially formulated pigment used for our purpose. When done properly using the right depth (papillary layer, most superficial layer of the dermis), to make impressions and also using a carbon based pigment diluted to match the right shade it will fade to a charcoal grey which still keeps the natural illusion of a shaved head. It only turns blue when you go too deep and it also can when using concentrated pigment without a dilution. It's different for everyone. Some people are more sensitive and others aren't. It may feel like a small pinching sensation or an annoying tickle. Most tend to fall asleep during the process. It varies with each client but it's less painful than a traditional tattoo.